Some weeknights, we’re just too busy to cook a complicated meal. With my stepdaughter’s school starting up again and Rosh Hashanah around the corner, time is at a premium here on the homefront. Fast and easy dinners are on the menu. Of course, we have our regular rotation of favorite recipes for every season… simple classics that never go out of style, the “oldies but goodies.” Once in a while, I like to stir things up by adding a new sauce or spice to a family favorite. It’s a good way to keep things interesting at the family table. Always keep them guessing! 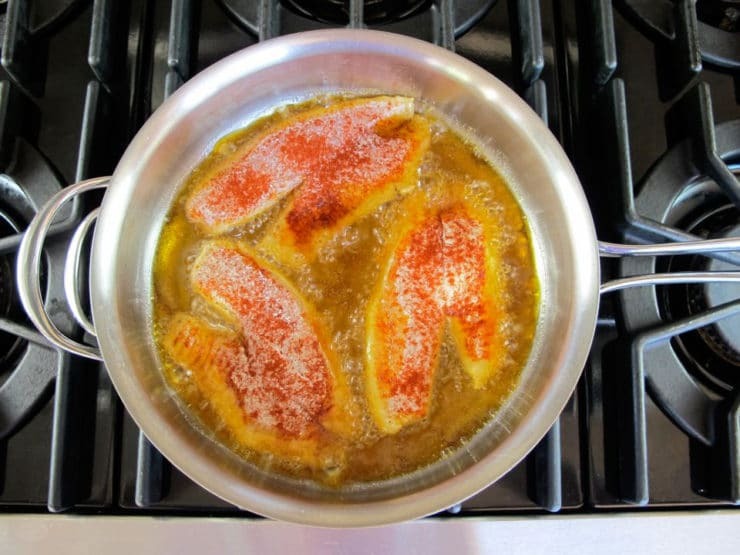 The base of this recipe is one of our family faves, a simple recipe for pan fried fish that was handed down from my husband’s mom. 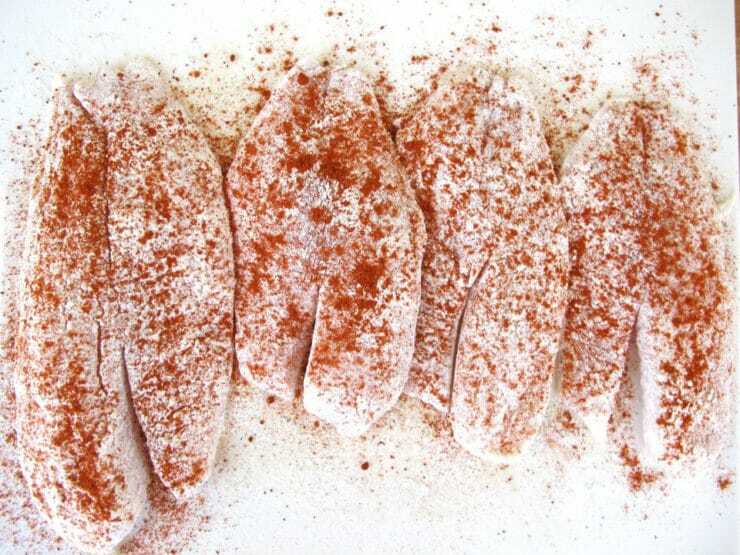 It’s a super easy preparation– fish (we usually use tilapia), sprinkled with pepper and salt, breaded with flour and paprika, and quickly fried to a crispy golden finish. I make fish this way every couple of weeks for dinner; it takes less than 15 minutes from start to finish, and the results are always tasty. The great thing is, I can change the dish completely by adding a new sauce. I’ve been known to top the fish with tahini sauce or leftover matbucha. Sometimes I throw together ingredients that are left in the fridge to create a fresh salsa fresca. Or, if I’m feeling really worn out and uninspired, I use jarred Arrabiata or Indian masala sauce. Each variation gives a new flavor, and we haven’t found one combination yet that we didn’t like. The fried fish creates a crispy, flavorful base that can be dressed up in a variety of ways. It’s been a really hot month here in Los Angeles. 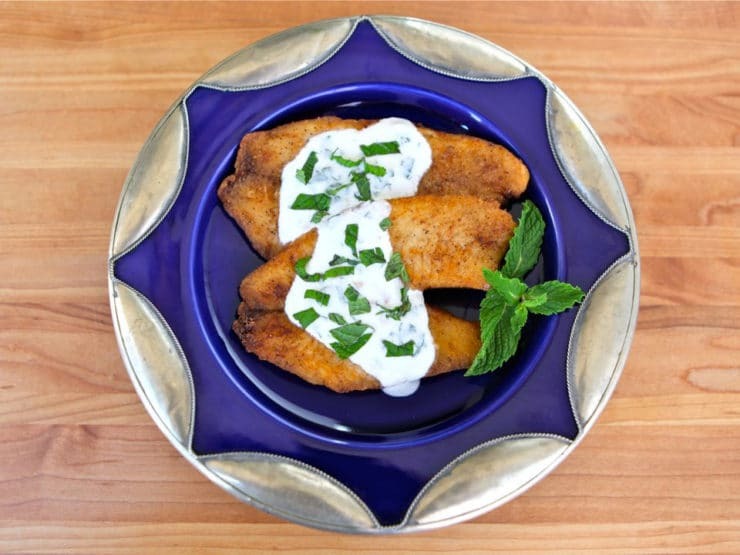 Last week, I was in the mood for cool and creamy flavors– something similar to tzatziki. We had Greek yogurt and leftover buttermilk in the fridge, so I combined the two into a lowfat, richly flavored sauce. The buttermilk added a nice tang to the yogurt. I tossed in some fresh mint, garlic, and red pepper flakes for a kick. The result was a creamy, perfect counterpoint to the crispy fish fillets. You can whip up this dinner in no time flat. Those of you who are gluten free can make this dish with King Arthur gluten free multi-purpose flour— I made it again this week, testing it with the King Arthur substitute, and it worked just fine. Try this fish with saffron rice or an Israeli salad on the side. It’s a simple and creative entree, and a unique way to dress up fish. 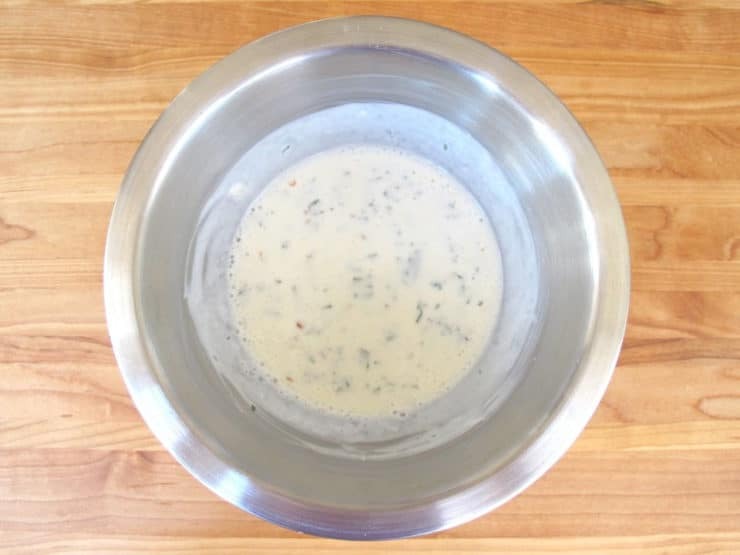 In a small mixing bowl, combine Greek yogurt, buttermilk, 1 1/2 tbsp chopped fresh mint, garlic, and red pepper flakes. Whisk together, season with salt to taste. Set in the refrigerator to chill while you prepare the fish. 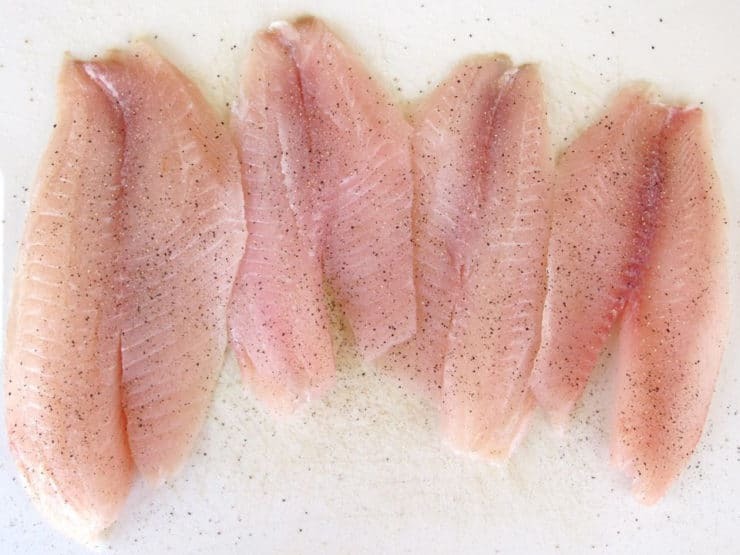 Rinse your fish fillets in cold water and pat dry with paper towels. Sprinkle each fillet on the front and back lightly with salt and pepper. 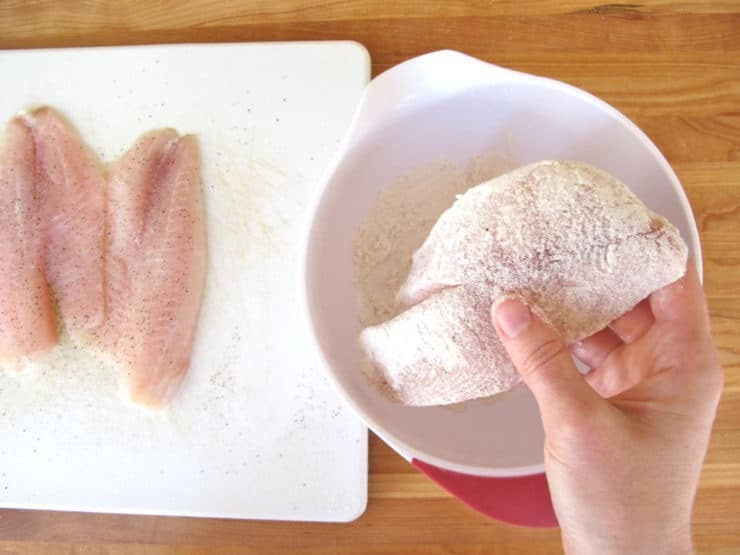 Dredge the fillets in flour or gluten free flour, making sure the fillets are evenly and completely coated with a thin layer of flour. Sprinkle the fillets on both sides with paprika. Heat oil in a skillet over medium till hot enough for frying. Add fillets to the skillet. If the oil is at the correct temperature, it should bubble and sizzle evenly—no splatters or popping. Do not crowd the pan, this will drop the oil temperature and make it more difficult to turn the fish. You may need to fry in batches to keep from crowding the pan. Fry the fish for about 3 minutes on each side, till the coating is golden brown on both sides and the fish is cooked through. 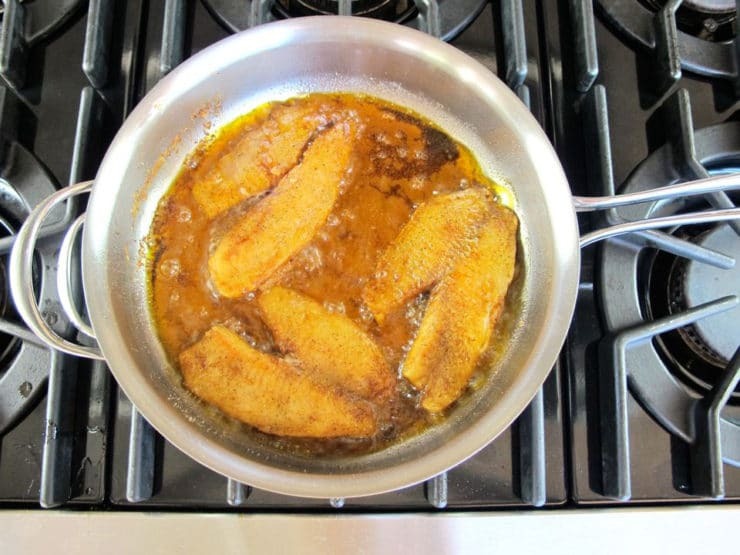 Set the fried fish fillets on a double layer of paper towels to drain. Serve warm fish fillets topped with the cool, creamy Greek yogurt mint sauce. Garnish each fillet with a bit of chopped fresh mint. Place a sprig of fresh mint on each plate, if desired. Hi Leah. Most non-Orthodox Jews have no problem mixing milk and fish, as they consider fish neutral in kosher law. You are correct that some Jewish groups will not mix the two, requiring a mouth rinse between fish and dairy. I don’t weigh the various approaches to kosher law as “more” or “less” kosher– they are just different interpretations. If, in your case, keeping dairy and fish separate is a concern, a non-dairy yogurt or sour cream (such as Tofutti) would be a workable substitute. Enjoy! Since we decided to scale down on the red meat, I have to make fish more interesting and appetizing. I have to try mixing yogurt with buttermilk. I love tangy sauces on fish. I am actually looking forward to winter now. It has been so hot here as well. This looks so easy. For those days when family says “I’m sooooooooo hungry” as soon as I walk in the door. And I like the idea for different sauces. I’ll be trying this soon! 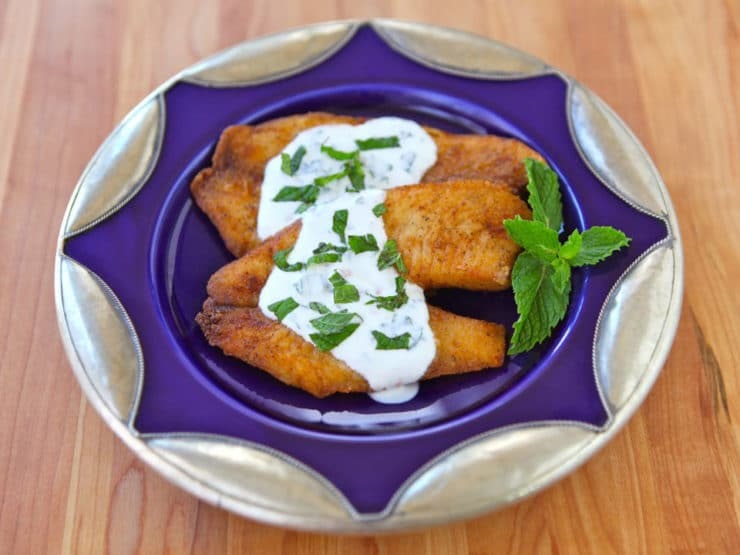 Do you have some alternatives for Shabbat or, esp, for those who don’t eat dairy with fish?